For so many Cobb’s Hill is an oasis. The humming of the drums on the Reservoir steps at sunset. Cityscape views where on a clear night you can see Lake Ontario. Lovers holding hands on the slope on blankets under the shade of trees. The walkers rhythmic circling. The bicyclists looping. The pulse of the basketball games. The electricity of urban softball under the lights. But every oasis is somewhere tinged with human tragedy. The other day I realized it had been ten years this June since Bradley Rudgers drowned in Lake Riley at Culver and Norris. 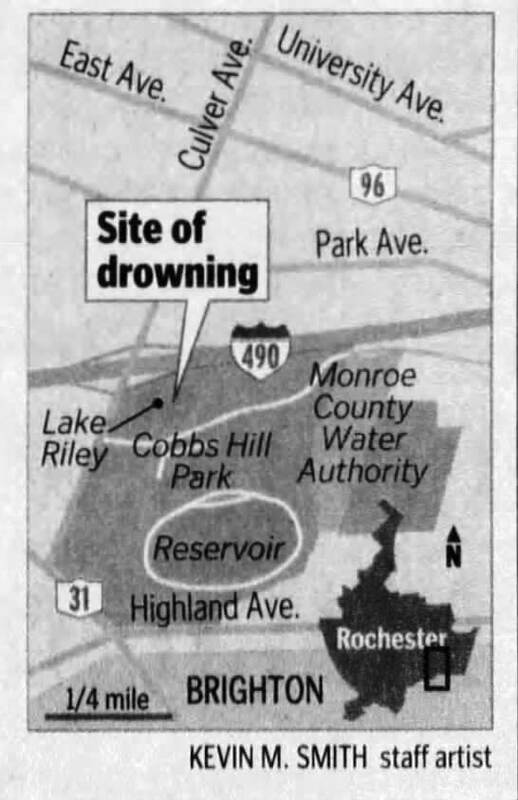 According to reports by the D & C and WXXI News on June 13th, 2005, Rudgers, 42, and a woman (described by WXXI as his girlfriend) tried to swim across the pond between midnight and 1:00 a.m. Police said Rutgers began struggling halfway across and could not keep his head above water. The unidentified woman swam back, trying to rescue him. But Rudgers went under, and the woman lost sight of him. She flagged down an RG&E crew who called 911. At 3:02 a.m. Rochester Police SCUBA divers found Rudger’s lifeless body. His last known address was an apartment on Meigs Street. Those were the only reported stories. Apparently, nothing more was known about Rudgers. I do remember in the days following no flowers or wreaths or balloons were left at the site by friends or anyone else. 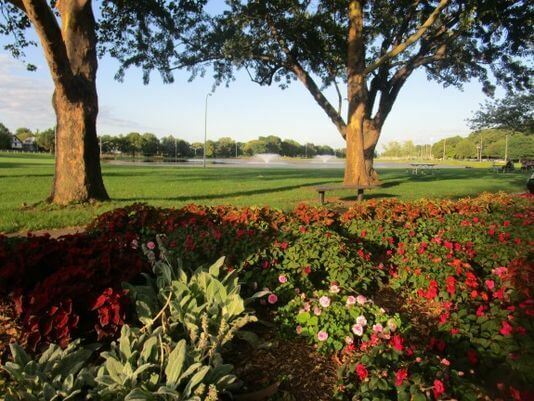 Then city commissioner of parks, Loretta C. Scott, said, despite the tragedy, there were no plan to put a fence around Lake Riley, adding that it would be a shame to interrupt the asesthetic value of the park. Ten years later I wondered if anyone remembered the incident or anything about Rudgers. On the internet, I had found no information on Rudgers, except that in 1989 he had been found guilty of burglary. Hardly enough on which to judge a man’s life. Asking people at the picnic benches and in parked cars, I discovered that most — even those who had frequented the park for years — had never even heard of the drowning. Two who dimly recalled thought Rudgers had entered the pond to rescue his dog, something unmentioned in the police report. No one knew anything about Rudgers himself. From Is there a poem in this tragedy? Every oasis somewhere tinged with human tragedy. Throughout these posts, I have tried to share the joys I have discovered on this what I call my summer of love. But I find sorrow too. Earlier in the summer, in Is there a poem in this tragedy? , I wrote about a young couple who died on train tracks in Pittsford in 1997. The entire situation of Jason, 16, and Melissa, 14, seems so different from that of Bradley Rudgers, 42, whose last known address was an apartment on Meigs Street. 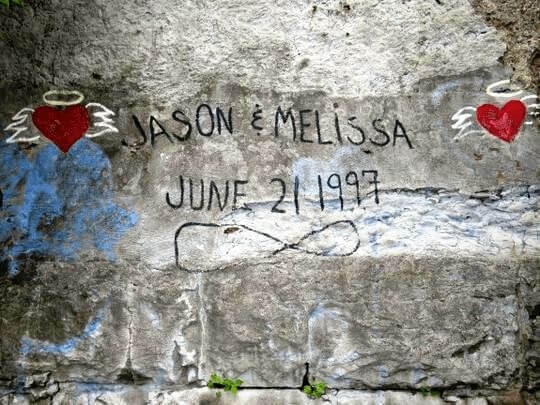 When Melissa and Jason died, there was communal outpouring of support. A plaque and their names inscribed on a rock wall in an oasis under the bridge on a beautiful stretch of the canal path. But all three made a tragic mistake that ended their lives. We know next to nothing about Bradley but surely the loss was felt somewhere. Maybe the little lore passed along is true. He went into Lake Riley to save his beloved dog trapped in the weeds.